A glabrous Ribes quercetorum flower from the Paroli home site in Culp Valley photographed on 18 January 2015. A pubescent Ribes quercetorum flower from the Paroli home site in Culp Valley photographed on 18 January 2015. Fig. 1. 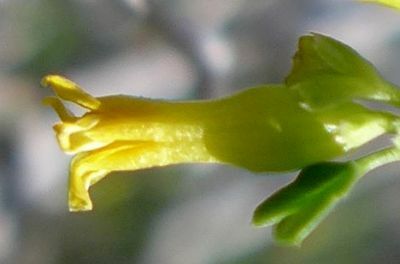 Left: photograph of a glabrous Ribes quercetorum flower. 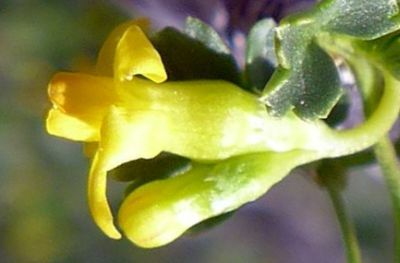 Right: photograph of a pubescent R. quercetorum flower. Click on any of the pictures on this page to get larger versions; a mm scale is shown in the larger version of the photograph on the right. 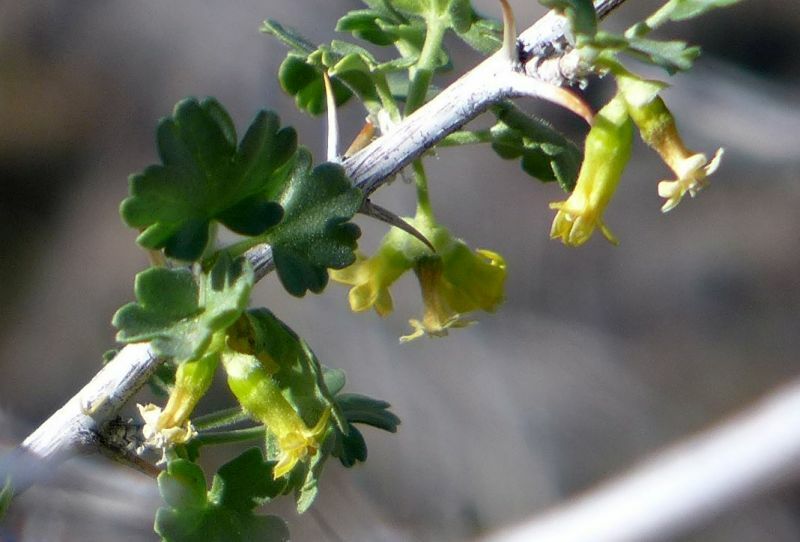 From 24 vouchers of Ribes quercetorum in San Diego County, Jon Rebman noticed that there seemed to be populations that consisted of only glabrous plants, and other populations that consisted only of hairy plants. He wanted to know from field surveys of a larger population if the two different forms occurred together anyplace, and if there were any other morphological characters that separated the hairy and glabrous plants. I and colleagues studied four different populations in January and February 2015. Three of those populations were small; two consisted of only hairy plants, and one had a single glabrous plant amidst a few hairy plants. A fourth large population of ~60 plants had roughly equal numbers of glabrous plants and hairy plants, with some specimens being sparsely-hairy. Analysis of flowers from all four populations showed no difference between hairy and glabrous plants. 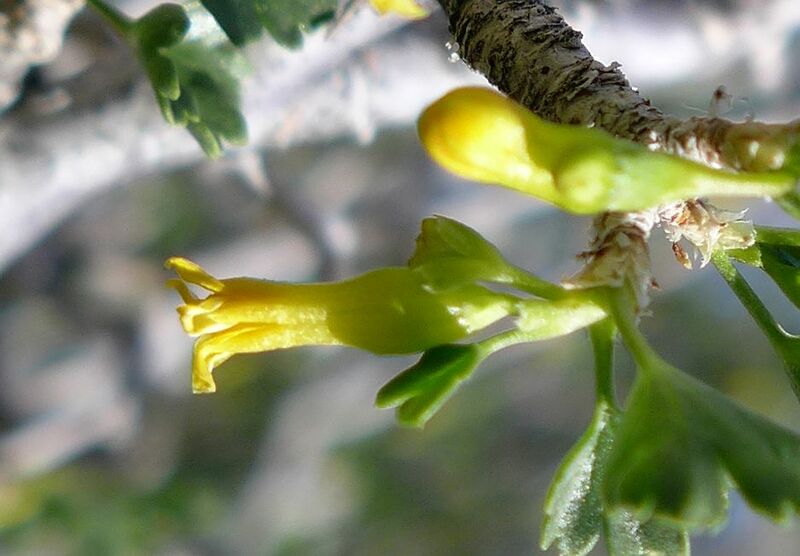 On 2 July 2014, I noticed that exactly half of the Ribes quercetorum vouchers from San Diego County, 12 vouchers, at the San Diego Natural History Museum had been redetermined as R. velutinum, a species that until then had not been thought to occur in San Diego County. I then looked at my pictures of both species, of the R. velutinum from the San Gabriel Mountains and the R. quercetorum from San Diego County, and found that the supposed separation of those species based on whether the hypanthium is +- as long as wide or longer than wide is less than abundantly clear. This was perhaps not surprising, since I had found in 2013 that the distinction between R. velutinum and R. lasianthum was less than abundantly clear for that same trait. I wrote Jon Rebman about this, and he kindly replied that he had noticed that in vouchers some populations consisted only of hairy plants, and other populations consisted only of glabrous plants. This had intrigued him, so to keep track of the difference, he determined the hairy plants as R. velutinum and the glabrous plants as R. quercetorum. He said he would like to know if the two different forms occurred together anyplace, and if there were any other morphological characters that separate the hairy and glabrous plants. This intrigued me, too. Jon is a good observer of differences in specimens, and has added a number of species to the flora of San Diego County from his realization that something was different about some of the specimens. His observations about the indument of these plants was especially interesting in light of the Jepson Manual description saying the leaves of R. quercetorum were "generally glandular-hairy", unlike the leaves of either our glabrous or hairy plants! So I decided to try to answer Jon's question in the early 2015 bloom period. I primarily concentrated on blooms, since I have previously found the leaves of Ribes so variable that they appear useless for distiguishing species. This turned out to be far more interesting than just tallying up glabrous and hairy plants! I had never studied R. quercetorum before, since I had always just assumed this was the only species in San Diego County with nodal spines and yellow blossoms. This study gave me a chance to actually compare it with the floras and other Ribes species. In November 2014 I and colleagues began checking on plants of R. quercetorum in San Diego County to make sure I didn't miss their bloom. We found plants in bloom in January and February 2015, surveyed their populations for glabrous and hairy plants, and I measured a sample of flowers from each population. When I measured the flowers, and compare them to the keys and descriptions in floras, the first thing I discovered is, in the words of Clyde Golden, that the different floras don't seem to be describing the same species under the name of R. quercetorum! This is not the place to discuss the inconsistencies, since the analysis here is just trying to answer one question about whether the hairy and glabrous plants are different species or not. 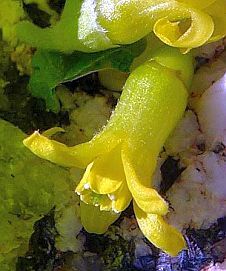 But lest the reader be confused in comparing the photographs and measurements presented here to the Jepson Manual description, I note that the fresh petals of R. quercetorum are yellow and 2 mm long, not "cream, 1 mm long", and the hypanthium is not always "longer than wide". All plants I've ever seen, and all photographs labeled as R. quercetorum, show yellow petals that are definitely longer than 1 mm, with a variable ratio of the hypanthium length to width. Furthermore, my observations are consistent with the last monograph on Ribes, from 1908, as well as the 2 mm petals in the Jepson Manual illustration for R. quercetorum. Note on terminology: The hairs on the plants are minute, typically 0.2-0.3 mm, and hence technically the plants are pubescent, since the hairs are only visible with a hand lens. For brevity I call these "hairy" plants in this analysis. I only list the field surveys in which we found blooming plants, with the numbers of glabrous and hairy plants found. 18 January 2015, by Tom Chester, Ted Caragozian, Adrienne Ballwey, and Nancy Accola. Two locations had plants in bloom. First, on Ted's private property in Ranchita, Ted had previously found just two plants there; both were hairy. Flower samples from the first blooms on the plants were taken from both. Second, at the Paroli homesite, we found a hairy plant growing right next to a glabrous plant. Both plants were in full bloom; flower samples were taken from both. 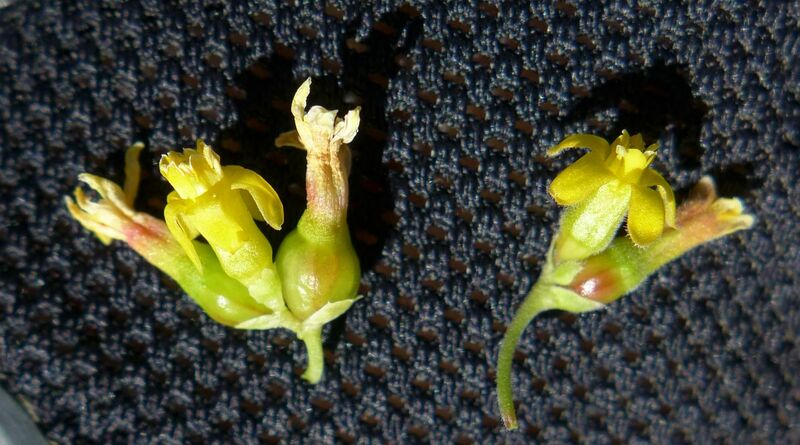 A third plant was found in bloom just west of these two plants; it was hairy and a flower sample was taken from it. 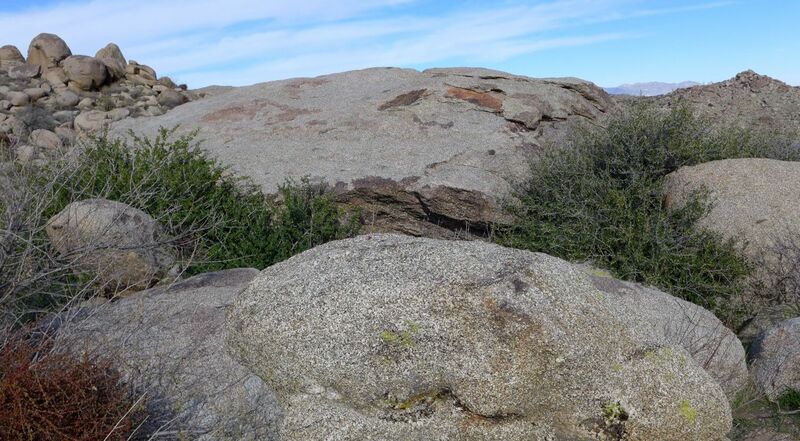 10 February 2015, by Tom Chester, Keir Morse, and Adrienne Ballwey, on the PCT south of Barrel Spring. Keir found one accessible plant in bloom; it was hairy and a sample was taken from it. 15 February 2015, by Tom Chester, Kate Harper and Jim Roberts in the Pena Spring Area. We found at least 60 plants in bloom. We examined 37 plants for hairs on the flowers; 15 of them were glabrous, 17 were hairy, and 5 were sparsely hairy, with the glabrous and hairy plants totally intermixed. Fig. 2 shows the geographic distribution of some of the plants that I also GPS'd. 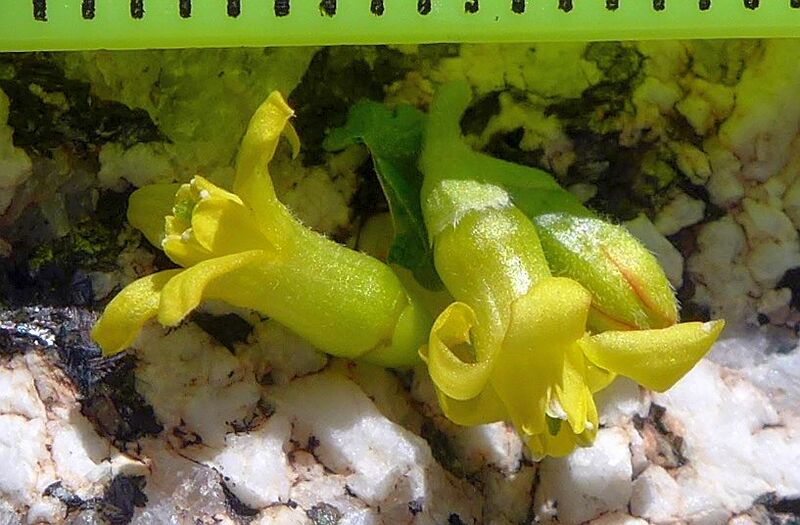 A flower sample was taken from the first hairy plant and the first glabrous plant we found, which were growing within ten feet of each other. Fig. 2. Map of the geographic distribution of hairy and glabrous plants in the Pena Spring area. The hairy and glabrous plants are totally intermixed in this area, with roughly equal numbers of each. Each latitude scale division of 0.001° corresponds to 111 m = 367 feet. The habitat is uniform in the area of this map, with many of the plants growing within bushes of catclaw acacia, Senegalia greggii (Acacia greggii). Comparison to vouchers. The Paroli homesite had a single voucher of a glabrous plant. We found that glabrous plant was accompanied by at least two hairy plants. 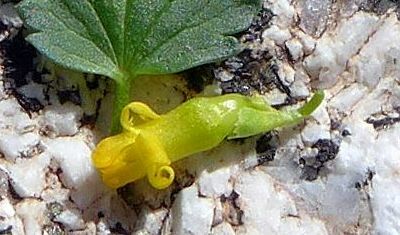 The Pena Spring area had a single voucher of a hairy plant. We found 15 glabrous plants; 17 hairy plants; and 5 intermediately-hairy plants. 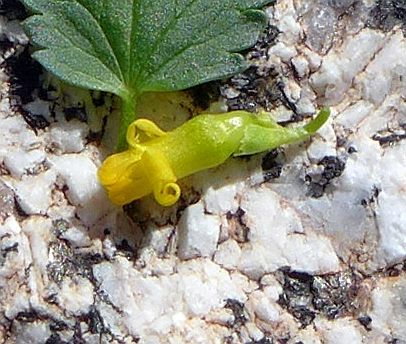 A side by side view of the flowers from the first glabrous plant and the first hairy plant we found in the Pena Spring Area are shown in Fig. 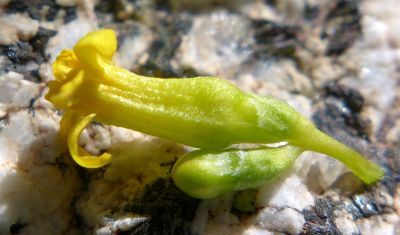 3, and a photograph of intermediately-hairy flowers from the Pena Spring area are shown in Fig. 4. Fig. 3. Side by side view of the flowers from the first glabrous plant and the first hairy plant we found in the Pena Spring Area. Note that the aged dried petals and sepals above the largest developing fruit have turned to a cream color. Click on the photograph for a larger version. Fig. 4. Photograph of intermediately-hairy flowers of a plant in the Pena Spring Area. Click on the photograph for a larger version. The shape of the flower varies tremendously from flower to flower and especially with the age of the flower. Fig. 5 shows photographs of flowers from the same glabrous plant at the Paroli home site. Fig. 5. Variation in flowers from the same plant at the Paroli Home site (not to scale!). Note especially the variation in the ratio of the hypanthium length to width, and the variation in how reflexed the sepals are. Click on the pictures for larger versions. 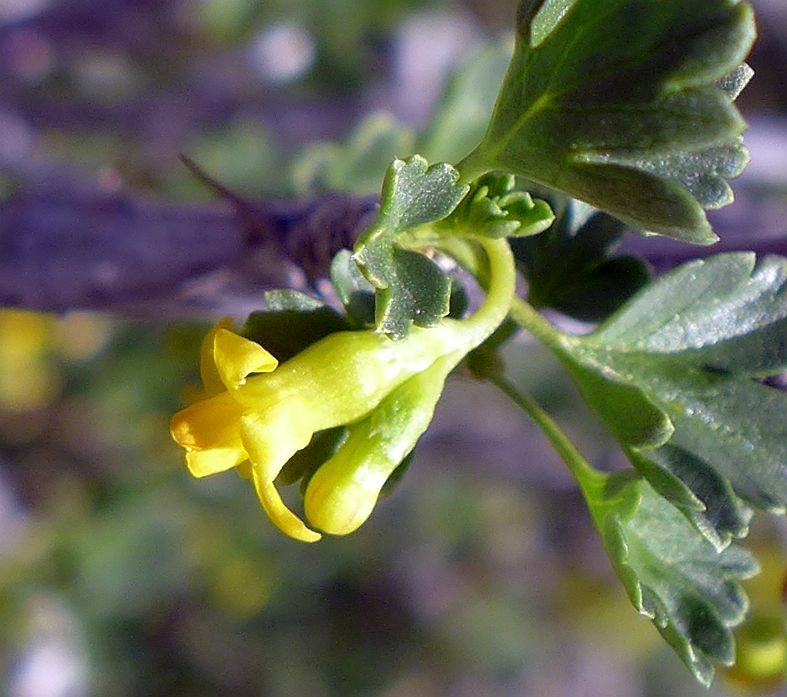 Flower samples were taken from four populations of Ribes quercetorum found in the three field surveys detailed above. Two of those populations had only hairy plants, with hairy leaves and flowers, and two had mixed populations of glabrous and hairy plants. More of the hairy plants were sampled since they were encountered in the first survey, when multiple flowers were measured in order to establish the range of variation of the measurements. As a result, I ended up measuring eight hairy flowers and two glabrous flowers. In the following plots, Figs. 6-9, the red diamonds are measurements made on two glabrous flowers, and the blue rectangles are measurements made on eight hairy flowers. 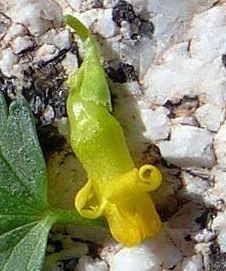 In the plot of petal length vs. sepal length, the petal length of a glabrous flower was increased from 2.0 to 2.04 mm in the plot so that its symbol would not be hidden by a symbol for a hairy flower. The plots show that the glabrous flowers and the hairy flowers are consistent with being samples from the same underlying distribution from a single species. Figs. 6-9. Plots of various measurements of floral parts from glabrous flowers (red diamonds) and hairy flowers (blue rectangles). There was no measured difference between the flowers of glabrous and hairy plants except for the hairs themselves. Hairy plants and glabrous plants occur together in large numbers in the Pena Spring area, with roughly equal numbers of both types, as well as some intermediately-hairy plants, all intermixed geographically. There is no morphological difference in the flowers. The other locations sampled had few plants, making it difficult to draw any conclusions about the ratio of glabrous to hairy plants there. Due to the confusion in the floras about the characteristics of three similar species, R. lasianthum, R. quercetorum, and R. velutinum, it isn't at all clear to me whether these are actually separate species, or, if so, how one could possibly say whether these plants are R. quercetorum, a non-glandular fruit form of R. velutinum, or even an undescribed species. We are in desperate need for a modern study on this group of species. I thank Jon Rebman for noting the difference in hairiness that stimulated this investigation. I thank Kate Harper, Jim Roberts, Keir Morse, Adrienne Ballwey, Ted Caragozian, and Nancy Accola for help with the fieldwork. Kate and Jim were tireless in seeking out plants in the Pena Spring area and noting whether they were glabrous or not. I thank Clyde Golden for coming up with the marvelous phrase that the different floras don't seem to be describing the same species under the name of R. quercetorum.